Who’s afraid of Fairy Tale Forests? Although strictly speaking, they are not a “creature of the night”, forests scare me…perhaps because traditionally they are the natural habitat of creepy, crawling, scary things? 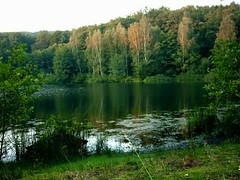 Growing up in Northern Germany, one is rather blessed with an abundance of forests, mysterious lakes and rivers. Am I freaked out by forests because trees are sinister ancient beings, whispering behind my back, as I’m trying very hard not to be eaten by wolves? Erm…no…they’ve all been slaughtered by mankind, so nothing scary left in that canine quarter. What about bears? Nope, they went the same hearth-rug way as the wolves. Perhaps it’s the wild boars that still roam the Northern German forests? Nope, they are quite shy creatures and usually run away. So why am I scared? I blame it on literature. Forests in books are often depicted as quite anti-human. Think of the forest in Harry Potter, where gigantic spiders have made their home or the way Tolkien uses trees and the forest to actually go into battle in The Lord of the Rings. 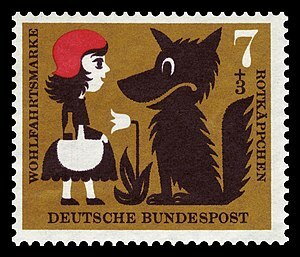 There’s also Little Red Riding Hood herself…not to mention Hänsel and Gretl, whose plight terrified me as a child – and in Germany children get to read the Brothers Grimm stories as originally intended – for an adult audience – not the watered down Victorian translations published in the English language versions of the famous fairy tale collection. Witches are burnt in ovens, children get eaten and nasty stepmothers have to dance with hot irons strapped to their feet until they die…the original Brothers Grimm stories don’t show a lot of mercy to culprits, I’m afraid. Trees…every one of them offering a huge living space for all manner of animals, from birds, mice, bugs, slugs, worms, spiders and other insects to mischievous spirits, dwarfs (Zwerge) and fairies. Trees should be viewed as friendly, life-giving beings. Their wood can be burned to keep us warm and safe. Yet, literature rarely seems to view them that way. Getting lost in a forest – let’s face it, who hasn’t left the trail for a clandestine pee behind a tree – is an unpleasant experience. As soon as it gets dark on a winter’s afternoon, forests turn into something unutterably hostile…a veiled threat behind every pine branch, danger lurking behind every oak and underneath every upturned elm root…the primeval fear humans have of the unknown? TV shows like True Blood are rather unusual in that they depict vampires living everywhere, including rural areas, where the loss of victim after human victim would soon flush out the supernatural being and earn them a stake through the heart for their trouble. Not that the vampire genre is based on logic, you understand. When I started out writing Willow stories, I wanted them to take place in a rural setting. Small villages in the middle of nowhere are scary places, too, no matter how picturesque they might appear to the visiting tourist. Just like trees they sustain a multitude of life, but make no mistake, there’s real danger lurking in Stinkforth-upon-Avon’s community! Are trees so ancient, they can no longer comprehend the feelings and thought processes of lesser “mortals”, even vampires, who can “live” their afterlife for centuries? Are small village societies so cut off from the rest of society that they make their own rules? I grew up in one, perhaps that’s why I chose a small village as the scariest of settings I could think of. Interesting thoughts. I think the psychological fear of the forest comes from it getting darker sooner than other places. Basic fear of the dark type of thing. Primal instinct. Yers, I wonder if it goes back to the time when “humans” were furry little mammals, hunted down by grassland and forest dwelling predators.Interesting theory about the darkness in forests…it’s certainly a factor with me. I dont like forests either… you can get lost and god knows what is out there after dark. Yes, and when birds and other wildlife stop singing, tweeting and such it gets even more eerie and spooky in forests.